Delivering home design, decor, and DIY inspiration from my front door to yours. 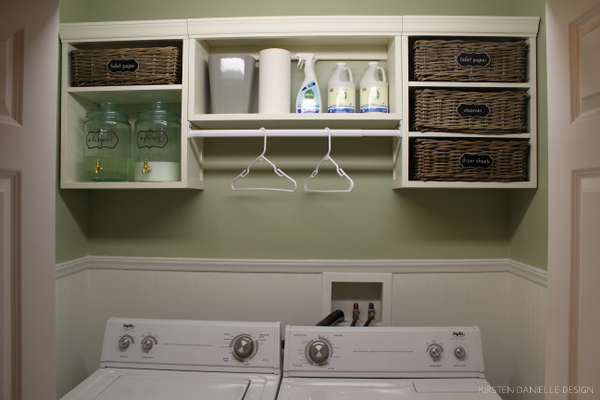 Epic news on the homefront...our little laundry closet makeover is finally complete. And we did it all for just under $100. It's been nearly done for a few months, but it took me awhile to get my act together and make the little labels for the baskets. Prepare yourself for an obscene number of photographs of a glorified closet. 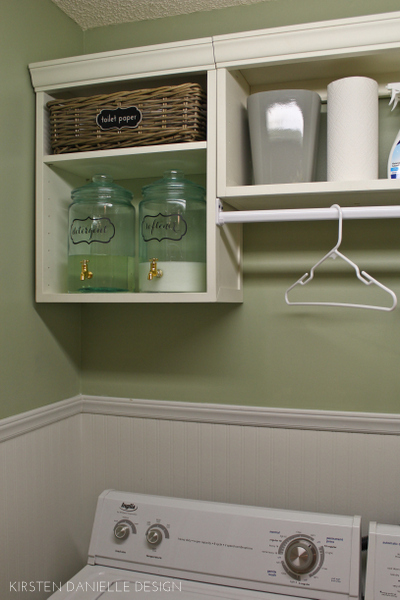 If you recall, I started the process by removing the ugly wire shelf, and painting the whole closet green to freshen it up a bit. However, once everything was green, the white box where the water lines run became a huge, glowing eyesore since it was a white box in a sea of green. To conquer this, I decided to run beadboard wallpaper up half the wall to disguise this little guy, which I think turned out pretty well, don't you? We then lived with the closet empty and shelfless for a solid 8 months or so, until I found that sweet shelf contraption. It's originally from Pottery Barn, but I got it for a $50 steal from Mr. Craig and his list. The center shelf was just a little too long to fit in the closet, so we hauled it down to Noel's parents house where Papa Dubs trimmed it down for us. I knew I wanted space to hang clothes (so we could stop hanging our clothes in the shower while they dried), so we bought an expandable rod from Home Depot for a few bucks, and installed in once the shelves were hung. Even though this was all fine and dandy and could have been complete since we now had ample storage space, I didn't stop there. I found those baskets on clearance for $5 each at Target (which fit like a GLOVE). 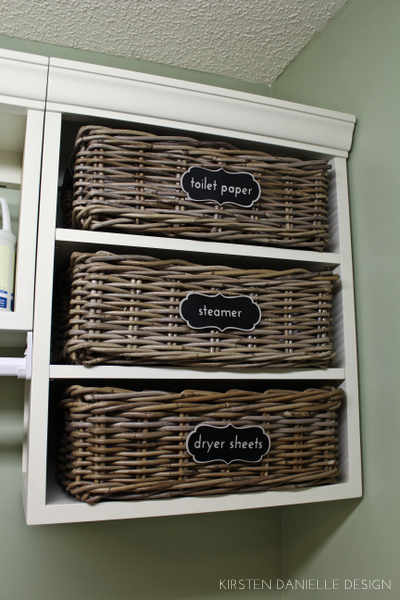 I wanted to put baskets on the shelves because it made the space feel more organized by hiding all of our laundry accessories. 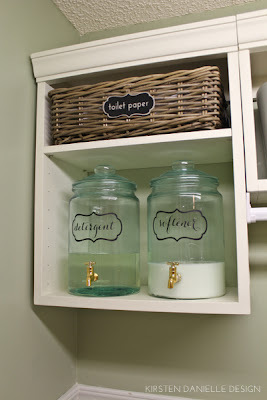 And as if that wasn't enough, I scored those two awesome beverage dispensers for a steal of a deal at Home Goods to hold our detergent and softener (sidenote, they look pretty, but don't work very well...we've since gone back to using the bottles). 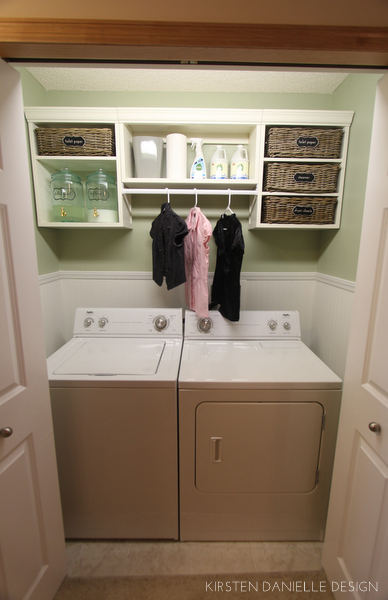 ...which led to the end result of this happy little laundry closet. Isn't she pretty? You and your labels :) Love !! my laundry closet is the exact same layout and space. Right now there is an ugly wire rack in there too and I hate it! Thank you so much for this idea!! Looks soo great!! 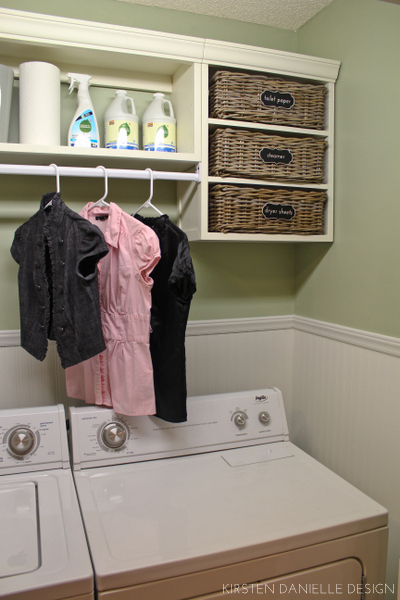 We currently have a blah washer/dryer closet but it's a rental so we can't change too much. 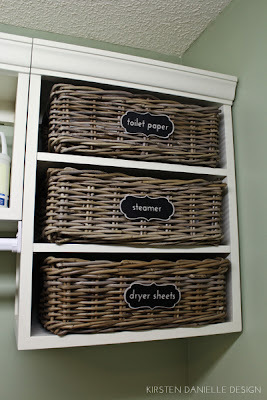 I do want to get some cute baskets and I'm LOVING your detergent dispensers. SO cute. It looks a million times better. Our laundry closet is in the basement and it doesn't even have drywall. The rest of the basement was finished nicely at some point, but not that part. 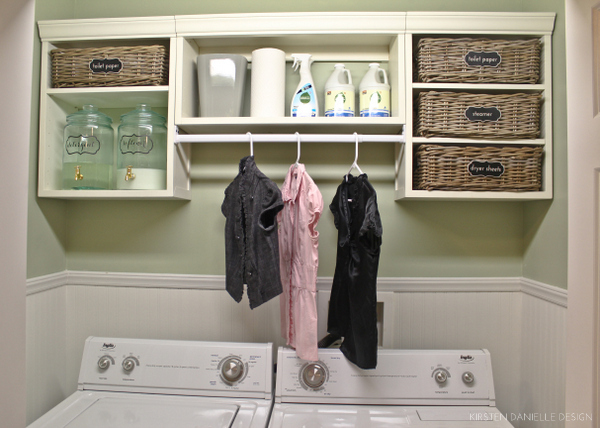 I feel like that's how a lot of laundry rooms are...ours growing up was that way too. I love it! 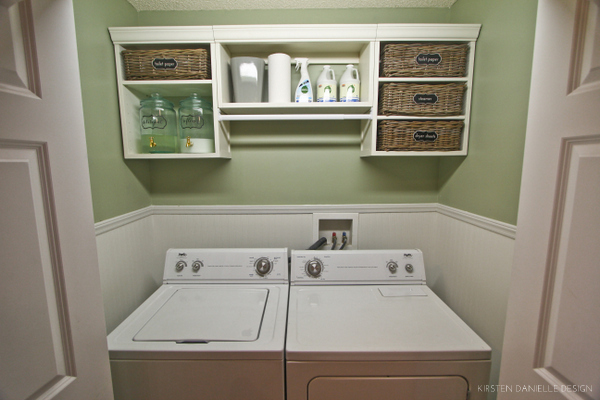 Come redo my laundry area! It's lovely! What color and brand of paint did you use? Thanks! Thank you, Olivia! I used Behr 400F-4 (Restful). Love it! Been looking to do something with my laundry closet for a long time, now I know where to start thanks! Can you tell me more about the cabinets? You said they are originally PB, do you know what they are called? Trying to find something similar..
Lovely! I noticed you flip-flopped the washer dryer, too. How did you manage that? My closet is "wired" backwards, and I'm worried about the dryer vent alignment. I love this makeover! I just bought a condo and have the exact same arrangement with the wire shelf and all! I love every single thing you did in your space, and I'm excited to see you were able to move the washer and dryer (of course - that's how they got there in the first place!) to paint. I was thinking paint or wallpaper - or both! A brilliant job! I absolutely love it!!! 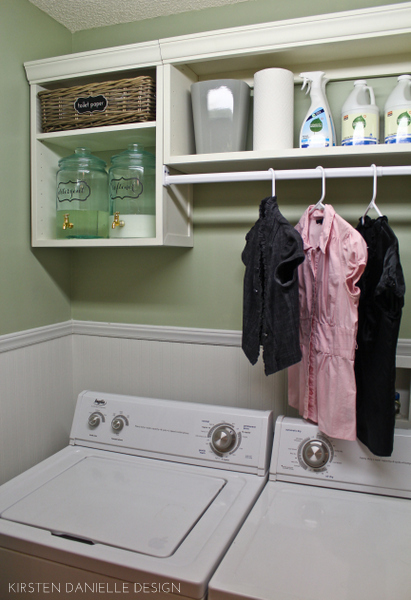 I gotta redo my laundry room ASAP!!! So do you not have laundry baskets or where do you keep those? Wow, what a transformation ! It came out so lovely and i can't get over that "faux" beadboard.....it's gorgeous !! Can you tell me how many rolls of it you used ?? Thanks for sharing.